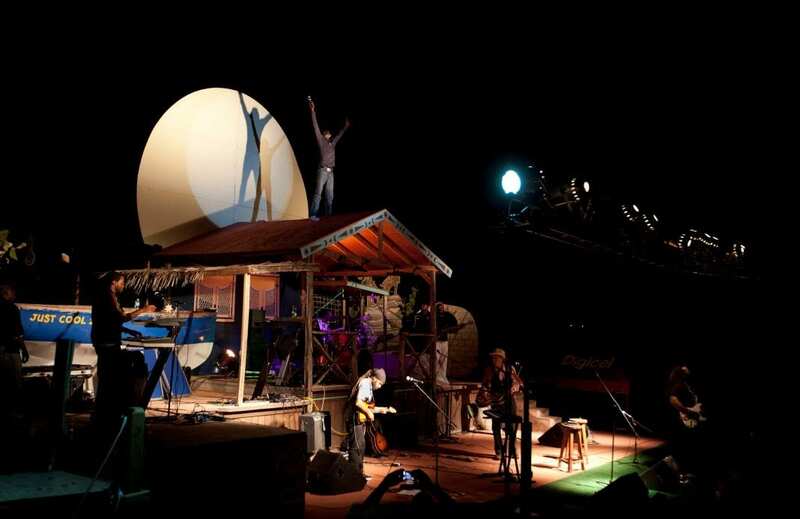 Anguilla’s iconic Moonsplash Music Festival will once again take place under a full moon at the legendary Dune Preserve on Rendezvous Bay, from March 21 – 24, 2019. Music lovers and Anguilla fans were devastated last year, when for the first time in its 27 year history, Moonsplash producer and creator Bankie Banx suspended the event, as repairs to the venue were still underway. Some of the biggest names in reggae music have graced the Moonsplash stage — Steel Pulse, Jah Cure, Gregory Isaacs, Sugar Minott, Marcia Griffiths, Bunny Wailer, Inner Circle – just to name a few. So have popular music artists like Jimmy Buffet and John Mayer, and award winning rappers Nas and Q-Tip. It is a magical experience, on an extraordinary island. This year’s Moonsplash returns to its roots as the Coolest Beach Party in the Caribbean. Timed to coincide with the first full moon of the month, the magical evenings unfold at the rustic Dune Preserve, Bankie’s legendary retreat, that doubles as laid back beach bar by day and pulsating dance party each evening. The newly renovated beach bar now accommodates 500 persons on decks and another 500 under a temporary beach extension. Highlights of this year’s Festival are two, not to be missed celebrations — Sheriff Bob’s 80th Birthday Bash and Third World and Friends 40th Anniversary celebration. Robert Saidenberg, The Sheriff of Goodtimes (aka Sheriff Bob) met Bankie Banx in the late 80s at a recording studio in New York City. Bankie invited Sheriff down to Anguilla and that summer they started planning the first Moonsplash. This is a very special year for The Sheriff of Goodtimes as he’ll be celebrating his 80th Birthday at Moonsplash 2019. He was also the subject of the 2018 award-winning short documentary film, The Sheriff of Goodtimes, which won Best Short Documentary at the Big Apple Film Festival. Third World, the ‘Reggae Ambassadors’, is one of the longest lived Reggae bands of all time, and the world’s greatest reggae fusion band, mixing in elements of R&B, funk, pop, rock, dancehall and rap. With 10 Grammy nominations and catalogue of charted hits spanning four decades, Third World will be releasing a new studio album in Spring 2019, produced by 4-time Grammy winner, Damian “Jr Gong” Marley, the youngest son of the legendary Bob Marley, under the Ghetto Youth International imprint. The lead single “Loving You Is Easy” was released late 2018. Moonsplash kicks off at 6:30PM on Friday, March 22nd with Funky Horns SXM on the Beach Stage, along with other supporting acts. Headliners on the Main Stage later that evening are Anguilla’s own Omari Banks and the legendary Mighty Diamonds, with additional supporting acts to be announced. Omari’s international musical career has taken him on tour to North America, Europe and Asia, and his recently released single “Me and You” was produced by multi-platinum, multi-Grammy nominee Jason “J Vibes” Farmer. Tabby, Bunny and Judge have produced over forty albums in their long and storied career. On Saturday, March 23rd, starting from 6:30PM on the Beach Stage, festival fans will be treated to the Sheriff’s 80th Birthday Bash featuring Orange Grove, the popular Sint Maarten band whose infectious sound echoes traces of rock, hip-hop and reggae, and Sheriff and the Deputy, featuring Kat Minogue and Captain Bob. Sheriff and The Deputy play traditional Folk, Rock, and Country music – the band enjoyed 9 months of performances at Opry City Stage, the NYC branch of the world-famous Grand Ole Opry. The Third World and Friends 40th Anniversary Celebration takes the Main Stage later that evening, along with the Festival’s own impresario, the incomparable Bankie Banx, and the versatile True intentions, a reggae band that originated in Anguilla with roots in Dominica, who has rocked the local and regional music scene. A surprise guest will complete Saturday’s fantastic line up. On Sunday, March 24th, the Moonsplash Beach party commences at 11:30AM with spontaneous appearances by the Bankie Banx Moonsplash cast. A host of fun activities are planned for the day. Cool vibes, great beaches, thrilling performances, amazing music — what more could you wish for? A Beyond Extraordinary experience awaits you when you join us at Moonsplash in Anguilla next month. For information on Anguilla, please visit the official website of the Anguilla Tourist Board: www.IvisitAnguilla.com; follow us on Facebook: Facebook.com/AnguillaOfficial; Instagram: @Anguilla_Tourism; Twitter: @Anguilla_Trsm, Hashtag: #MyAnguilla. It’s official – Anguilla is Beyond Extraordinary! 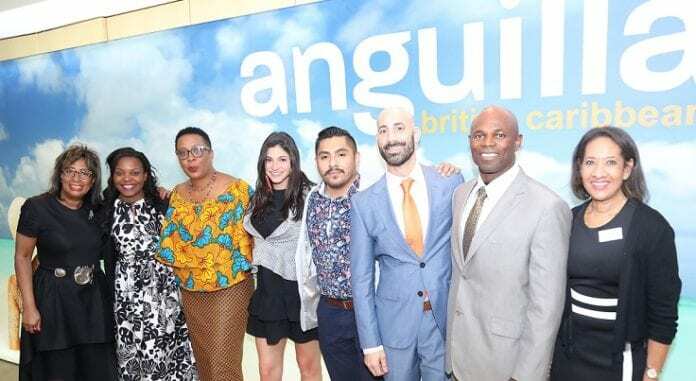 The Anguilla Tourist Board (ATB) launched its Beyond Extraordinary destination campaign at a festive event in New York City on Tuesday, December 11th, at The PUBLIC, An Ian Schraeger Hotel. A delegation comprised of the Hon. Cardigan Connor, Parliamentary Secretary, Tourism, Mrs. Donna Banks, ATB Chairperson, and Mrs. Shellya Webster, Manager, Corporate Affairs at the ATB head office, briefed 100 leading travel industry partners, island stakeholders, and representatives from the trade and consumer on new developments on island, and new marketing initiatives being undertaken by the Tourist Board. In his welcome remarks, The Hon. Cardigan Connor, Parliamentary Secretary, Tourism highlighted the two new luxury brands that now call Anguilla home — Relais & Chateaux and Belmond, joining the Four Seasons and Auberge Resorts Collection, and independent brands CuisinArt Golf Resort & Spa and Zemi Beach House. Mrs. Donna Banks, ATB Chairperson, gave a comprehensive update on Anguilla’s tourism product, from access and accommodations through experiences and activities. She then introduced the Beyond Extraordinary campaign, aimed at sharing all the extraordinary aspects of Anguilla with travellers and travel planners alike. Beyond Anguilla’s renowned 33 public, pristine white sand beaches and turquoise waters –Anguilla’s activities include festivals, music, an award winning dining scene, boating and sport events, off-shore cays, caves and so much more. The campaign aims to capture the diversity and richness of the Anguilla experience, and it will utilize stunning visuals to highlight the island and varied activities across digital advertising, search engine marketing, social media, online video, and many other tactics. “Our Beyond Extraordinary campaign represents a greater investment by the Anguilla Tourist Board in the transformation of Anguilla’s marketing to embrace digital and mobile first strategies,” said ATB Chairperson Donna Banks. “We are positioning ourselves to compete in today’s tourism market, which increasingly depends on digital and mobile technology,” she continued. A highlight of the evening was the unveiling of the Anguilla Tourist Board’s brand new web presence at IvisitAnguilla.com. In addition to gorgeous images of beautiful beaches and easier user navigation, the website provides many useful features for visitors to explore Anguilla including: an interactive map of the island that allows users to quickly find the best places to eat, sleep, relax, and celebrate; a custom itinerary builder where visitors can “favorite” any restaurant, hotel, or activity to organize a personal travel experience; Editor’s Picks with suggested itineraries for 3, 5 or 7 day trips geared toward different types of travelers; and so much more. The evening concluded with a series of surprise drawings for hotel stays, restaurant specials and airline tickets courtesy of Anguilla’s leading properties — Malliouhana, Auberge Resorts Collection; Zemi Beach House Hotel & Spa; Frangipani Beach Resort; CuisinArt Golf Resort & Spa; Carimar Beach Club; Shoal Bay Villas; Belmond Cap Juluca; Blanchard’s Restaurant and Beach Shack; Tasty’s; Mango’s; Good Korma; Veya; Dolce Vita; Seaborne Airlines and Tradewind Aviation.